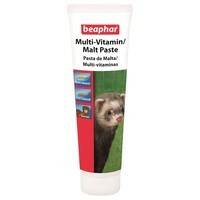 Beaphar Vitamin Malt Paste for Ferrets offers a yummy treat as well as a beneficial, nutritional supplement, developed to ensure ferrets receive all the nutrients they require to remain healthy. The unique formula combines essential vitamins and minerals including taurine and bioMOS, both of which support the digestive system and prevent stomach upsets in ferrets. This malt paste can be served with food or directly from the tube. My ferrets love this and it is excellent for perking up older ferrets and the reassurance they are getting everything they need. Best price out there too. I buy this Vitamin Paste for my pet Rats and they are completely mad about it, they have even gone as far as trying to take it out of each others mouths!! Its excellent as an aid for giving antibiotics as you can just mix any medicine into the paste and it all gets eaten with no problem at all as the lovely malty taste hides the medicine. It gives a good boost of vitamins of pro-biotics at the same time so I can't recommend it highly enough for poorly rats or just for a beneficial treat.